We have succumbed, in recent years, to technological passivity, the assumption that there’s nothing we can (or should) do about what an older generation used to call “progress.” But that’s not true. War goes on, yet most of the world’s nations came together to ban landmines. Mines, humanity decided, were a horror we could no longer live with because their murderous potential remained long after the frontlines moved elsewhere, even after hostilities ceased, and mostly hurt civilians. Similarly, chemical weapons were banned after mustard gas scarred the World War I generation. Here in the United States, societal consensus supports bans of hollow-point bullets that explode inside the body (they’re currently banned by the military), high-capacity magazines for guns, the bump stocks that came to our attention after the mass shooting at a country music festival in Las Vegas, and semi-automatic assault rifles. Weapons aren’t the only tech to which society simply responds: “Hell no. Just. No.” Human cloning has prompted calls for bans by those who believe we shouldn’t plow ahead without better understanding the potential downsides. Alcohol and cigarettes are banned for children. Lots of drugs are banned. Banning products is a well-established societal and political prerogative. Drones should be banned too: military drones as well as recreational ones. We already have a substantial body of evidence that they are dangerous. Potential advantages, on the other side, seem relatively modest. They’re cool. I’ve played with them. No one has sat down to consider, in a careful measured way, the pros and cons of unmanned aerial vehicles. Where, as our skies are about to turn into the Wild West, are the Congressional hearings and expert opinions? If you stop to think about it, selling drones to any yahoo with $400 is a recipe for chaos. Launched from the roof of a Manhattan apartment building, a pervert’s drone can peep through windows. A terrorist, or merely a doofus, can fly one into the blades of a low-flying helicopter or into the engine or windshield of a plane approaching the airport. And they will. It’s only a matter of time. The terrorism potential became evident in 2015 when a guy accidentally flew his Phantom drone onto the White House lawn. Loading one with explosives is easy. Or a gun—a father and son affixed a pistol to a drone and fired it remotely in the woods of Connecticut. I’m even less sanguine about corporate and institutional applications. 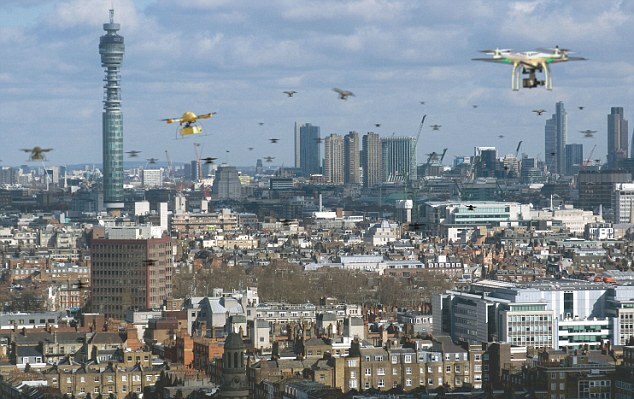 Whether it’s Uber and NASA’s announcement that they plan to launch flying taxis in Los Angeles or Amazon’s imminent fleet of delivery drones, I’m not sure I want to live long enough to hear buzzing drones where birds are supposed to sing, or see some dude’s dinner pass overhead. Maybe a sane compromise is possible, like limiting the gadgets to flight paths above major roadways. Why can’t we figure that out now, before the inevitable technological growing pains (aka deaths and injuries and overall crapitude)? While it’s easy to imagine how drones can improve our lives—they have already found missing hikers in the wilderness, for example—it is impossible to overstate how creepy it would be to put them into the hands of law enforcement. Obama attorney general Eric Holder said in 2013, and no legal expert challenged him, that the feds have the right to launch military drone strikes against American citizens on U.S. soil. California cops used one to track a rogue LAPD officer a few years ago. Local law enforcement drones could catch speeders, scan for expired vehicle registration and inspection stickers (stationary devices already do) and use thermal imaging devices to conduct warrantless searches. And there will come a day, not in the distant future, when the same Cleveland police department that shot 12-year-old Tamir Rice to death for the crime of playing while black will type commands into an iPad that controls an armed drone that blows up more innocent civilians. This is serious, major dystopian horror-show crap. Can’t we stop it before it starts? Overseas, and thus far from the decreasingly vigilant eyes of our increasingly establishmentarian journalists, the Trump Administration is expanding the military drone assassination program Obama expanded after inheriting it from Bush. Formerly focused on killing young men and whoever happens to be nearby in South Asian zones like Pakistan, where studies show that 98% of the thousands of victims were innocent, the drone killers are ramping up in new places like Africa. Like the innately disconcerting notion of letting local-yokel cops run wild with facial-recognition-enabled autopiloted self-guided missile drones, it is impossible to overstate how self-defeating America’s drone program has been to U.S. interests. Unlike here, where the nearly daily attacks barely rate a mention in the news, people in other countries and especially in the Muslim world are well aware of the fact that the vast majority of victims are innocent civilians, including many women and children. (Even the “guilty” men who die aren’t threats to the U.S., but rather to the corrupt local governments we supply with arms.) Local populations in cities where drones patrol the skies are jittery and resentful. Many have PTSD. True, drones eliminate harm to American soldiers. But we operate them in macho cultures that prize honor and courage. Our unwillingness to risk our sons and daughters in ground combat makes us look not just like aggressors, but cowards worthy only of contempt. In a war for hearts and minds, drones are propaganda suicide. We’ve begun a new arms race. When a foreign country or non-state actor attacks us with drones, who will listen when we complain? A drone ban doesn’t have to be forever. But it should last long enough for us to figure out, as Donald Trump used to say on the campaign trail, what the hell is going on. 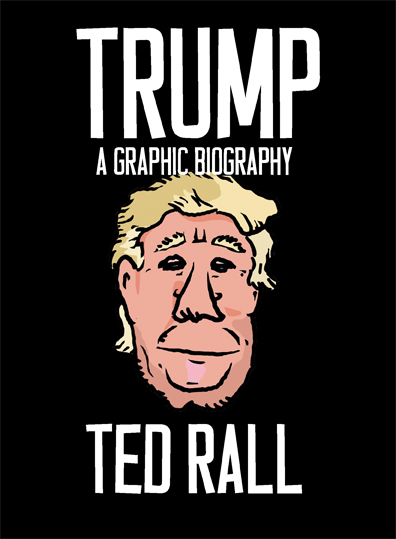 This entry was posted in Blog, Columns and tagged banning, bans, drones, dystopia, regulation, Technology on April 23, 2018 by Ted Rall. The Pentagon has unveiled an incredibly strong and agile humanoid robot. But don’t worry, it claims that this new “robo sapiens” is purely to help old ladies find their way through Nordstrom. This entry was posted in and tagged artificial intelligence, Atlas, cyborgs, DARPA, Department of Defense, drones, dystopia, humanoid robots, Militarism, militarization, pentagon, robo sapiens New, Technology, Terminator on July 15, 2013 by Ted Rall.